I’ve been sorting through some of my old photos recently – for old, read ‘1990s’. Very few of them have much interest from a retail point of view, but then it was generally more usual in those days for me to take pictures of historic buildings and attractive landscapes, rather than of shops. However, I did come across a couple of shots of Castle House, the now-closed Sheffield Co-op department store in Angel Street (click on the images to view them at larger size). 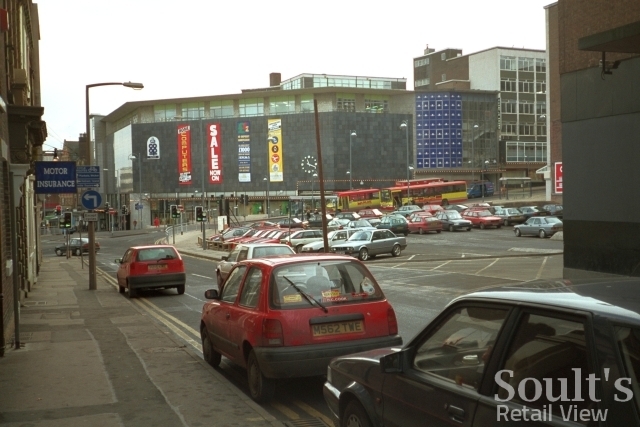 Back in 1997, the iconic store was very much still open, and I remember going there to buy my first CD player (!) and having lunch upstairs in the cafe. I can’t recall too much about the dining experience, but I have a recollection of the cafe being popular among Sheffield’s older residents, and (I think) featuring lots of trellis screens and artificial plants. Of course, even back then the shop had the faded charm and slightly peripheral location that seemed to go hand in hand with being a Co-op department store, and though it was no John Lewis, it was a nice shop to have in its own way. 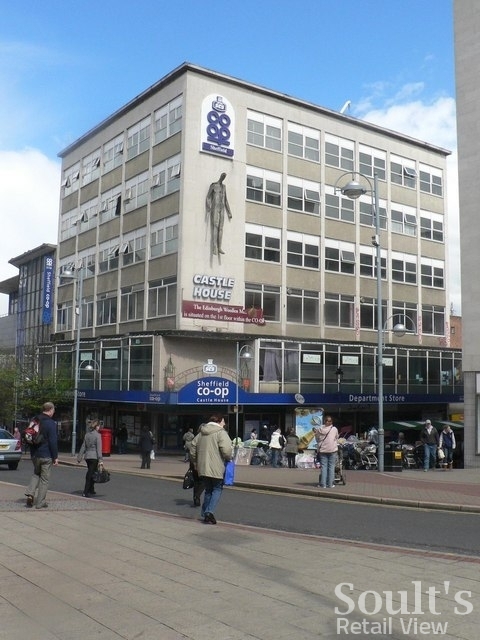 As I’ve written before, in a blog about the fate of Co-op department stores nationally, Sheffield Co-op’s merger with United Co-op, which then merged in turn with the larger Co-operative Group, led to the inevitable closure of the Castle House store last year. Though the store’s demise was deemed a ‘shock’ by the Sheffield Star newspaper, there was really little doubt that it would have to shut following the second merger – after all, the Co-operative Group had already pulled out of non-food in 2007, describing its loss-making department store operation as “a continuing major drain on our resources”. Rather like the former Newcastle Co-op department store, where the old food hall remains in just a small part of an otherwise vacated building, I understand that the food floor in Sheffield’s Castle House is also still open, along with the city’s main post office, occupying what Chris Downer calls “one wall of a cavernous and strangely empty hall… now that its ‘parent’ store, the Co-op department store, is no more”. Though the 1960s building’s architecture is not to everyone’s taste, Pevsner’s architectural guide to Sheffield highlights its impressive granite frontage and internal cantilevered staircase, and its controversial listing, earlier this year, gives hope that a sensitive re-use might one day be found – provided, of course, that there is a retailer out there who would be willing and able to occupy what is a very large site. Writing to the Star in June, “a group of ladies” supportive of the listing decision argue that the Sheffield Co-op department store should be “re-opened by a company to once again enjoy the interior and unique spiral staircase… and recreate the friendly department store as it once was”. Perhaps this could be another opportunity for Vergo Retail, given its record in saving old Co-ops that are “important, longstanding retail features in the towns and cities that they serve”[broken link removed]? 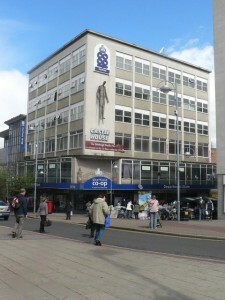 Thank you to Chris Downer for the use of the 2008 photograph of Sheffield Co-op, which is © Copyright Chris Downer and licensed for re-use under the CC BY-SA 2.0 Licence. By the way, if anyone has a photograph of the building as it is now, I’d be pleased to feature it in this blog, and would obviously credit the photographer. Drop me a line if you can help! 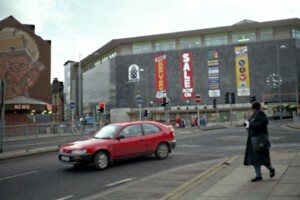 It would have been brilliant if the old Co-op could have been saved. I found that spiral staircase hypnotised me if I looked at my feet as I went down it as a kid but unfortunately, like you said, it just isn’t a great location and dept. stores generally aren’t what they once were. It is a real shame that such a great bit of Sheffield history has bitten the dust.